Eye-Site is an e-learning resource for ophthalmologists and is delivered by the Royal College of Ophthalmologists (RCOphth) in partnership with Health Education England e-Learning for Healthcare (e-LfH). More courses are being developed and will be available for ophthalmologists. Eye-Site is intended to complement and support existing teaching initiatives rather than replace them. Eye-Site contains interactive knowledge sessions, for use independently, or by blending e-learning content with local, regional or national delivery of skills-focused courses. The knowledge sessions will be augmented by other materials suitable to support face-to-face courses, and additional evidence based learning. Eye-Site’s content is mapped to the Royal College of Ophthalmologists’ curriculum for postgraduate training in Ophthalmology (http://curriculum.rcophth.ac.uk). Eye-Site e-learning materials focus on supporting trainees in years 1 – 3 of their run-through postgraduate training, with a plan to support subspecialty training in a later phase. Current e-learning sessions include Clinical Assessment, Refraction (testing for spectacles and other vision aids), Laser (including safety aspects), Ophthalmic Public Health, and Microsurgery skills (including basic phacoemulsification). The online materials supporting Microsurgery skills have allowed the Royal College of Ophthalmologists to transform their national course, enabling them to maximise practical training time during live courses. If you already have an account with e-LfH, then you can enrol on to the Ophthalmology programme by logging in to the e-LfH Hub, selecting My Account > Enrolment and selecting the programme. You can then access the programme immediately in the My e-Learning section. In the event that you do not qualify for free access to the Ophthalmology programme, you are able to license access through eIntegrity, a community-interest company established for this purpose. For more information on the licensing options available for the Ophthalmology programme, please visit the eIntegrity website. 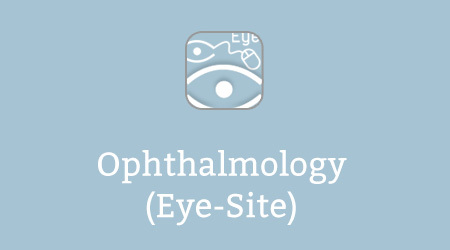 Eye-Site includes an online information resource ‘Ophthalmopaedia’. This is an encyclopaedia written by the community, under editorial control. Articles are succinct and up to date. Each is ‘owned’ by the author, who will maintain the accuracy of the material. Media may be submitted for addition to an article via the author and this will be displayed in ‘Galleries’. It is anticipated that the Ophthalmopaedia will form a growing expert knowledge base. In order to access the Ophthalmopaedia, you will need an e-LfH account. You can enrol by logging in to the e-LfH Hub, selecting My Account > Enrolment and selecting Ophthalmopaedia. You can then access it immediately in the My e-Learning section.